This 2 hour DVD of The Last 24 Seconds is also available. First Century Press presents Michael Fairchild's published articles and research regarding Jimi's death. These are the reports responsible for triggering the 1993-1994 Scotland Yard investigation into the death of Hendrix. As depicted in The Last 24 Seconds movie, Michael's research has been ripped off and credited to a collector thief called "Mr. Rob(ber)y". Doctors and attendants who handled Jimi's body recall him being covered with a large amount of red wine. Yet medical records show his blood alcohol level was 46 mgs when he died, meaning that his system hadn't absorbed a lot of wine: 46 milligrams, when converted to ounces, equals 0.0016 of an ounce - practically nothing. So a lot of wine got into him and then he quickly died before absorbing the alcohol. Heart stops, absorption ceases, and just a small amount of alcohol had time to enter Jimi's blood. So why was a lot of wine spilled all over and around him? He drowned. Was it a forced drowning? Did someone hold him and pour the wine in? Why was his hair, clothes, and bedding covered in so much wine? It's too suspicious. "Stickells and Barrett took Jimi's stuff, like messages. That was funny, that was so strange. 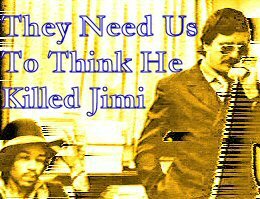 They only were interested in the messages Jimi had received...I do believe he got poisoned"
Below are excerpts of DEATH OF HENDRIX: The Last 24 Seconds seen through YouTube.com players. The complete film is 2 hours long. The 10 minute YouTube excerpts below comprise 50 minutes of the 2 hour movie. To see the complete 2 hour movie order a copy of the DVD. 2007: My Movie Says "ROADIE Killed Jimi"